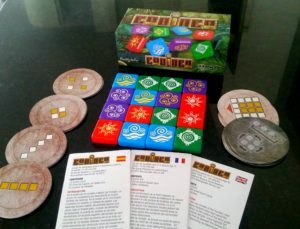 Codinca – is our much acclaimed pocket strategy boardgame. It was released at the 2016 UK Games Expo, Birmingham and loved there and at Gen Con 2016. Deep within the rain forests of the Yucatan rival teams of treasure hunters have recently discovered the lost city of Codinca. In the centre of the once great citadel stands a stone temple. Local legends tell of the great treasures that lie buried beneath the temple. Despite many months of searching no doorway or entrance has been found. Can you crack the code and be the first to unlock the secrets of Codinca? 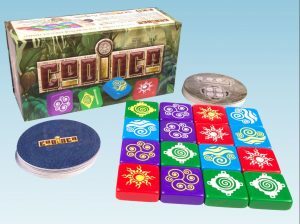 Shortlisted in the top three best new Abstract Games at the 2012 UK Games Expo, Codinca is a quick 2-4 player simple strategy game. Just like being at a real temple with movable stones, the tiles can be laid out in a matter of seconds on any flat surface. Each play uses either Earth, Wind, Air or water tiles. First of all players try to complete their own code of four patterns using double-sided tiles to win the game. In addition they have each got three Spirit Cards which can be especially relevant to win a game. The pocket-size version of the game was released at the 2016 UK Games Expo and hopefully at sometime it will be created into an app for android, iPhone, tablet, etc. Most of all Codinca is a fun game, a mix of strategy and adaptability. With a little bit of craftiness included games will probably result in a lot of fun.